From burgers and fries to locally sourced grilled meats and fresh salads, American food continues to increase in popularity in Russia. American visitors to Moscow may find the city more familiar than they expect, given the presence of American chain restaurants seemingly on every corner. 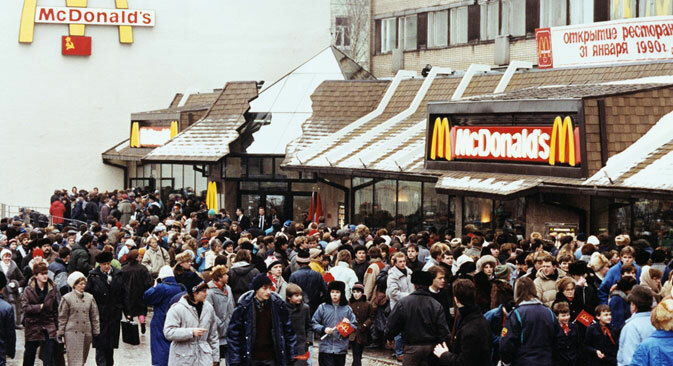 Chains like Subway (over 670 outlets across Russia), KFC (over 250) and McDonald’s (417) generally outnumber their local competitors like Teremok, which offers Russian pancakes and has only 228 outlets across Russia. But even the biggest names have to tailor their menus to a local audience. In Moscow, KFC offers for breakfast syrniki, a kind of cheese curd pancake common in Russia but unknown in the U.S. Burger King has also created a Lenten menu to accommodate the strict Russian Orthodox fast. And Starbucks, which caters to on-the-go commuters in the U.S., is more of a fancy cafe in Moscow with coffee prices in the $7-$10 range. Nevertheless, Starbucks outlets don’t seem to lack for clientele. Nick Miyares, an American who works in finance in Moscow, is a Starbucks regular, but he goes primarily for the food. “I will never pay $5 for an Americano when I can get the same thing for less than $1 at a Starbucks in the States if I bring my own cup,” Miyares said. Part of the appeal is undoubtably a chain’s American identity. Ksenia Lutsenko goes to McDonald’s for what it represents more than the food. “I like McDonald’s in Russia; it’s like a palace. I think it’s just childhood memories — when I went to elementary school, it was so cool to celebrate your birthday at McDonald’s,” Lutsenko said. restaurants have been popping up all over Moscow in the past couple of years. What is Russian for ‘McDonald’s’? Johnny Rockets, the Starlite Diner and the Beverly Hills Diner are among the top 100 places where people in Moscow “check in,” along with Friends Forever, a trendy cafe that serves American-style food and desserts like cupcakes and cookies that are not traditional Russian treats. Other American chains such as T.G.I. Friday’s and the Hard Rock Café are also popular. Last fall, Moscow marked another milestone in its love affair with American food. A branch of Saxon + Parole, a New York restaurant from executive chef Brad Farmerie, opened in the Patriarshy Prudy neighborhood. Yekaterina Fadeyeva, brand manager of Saxon + Parole, noted that while there are still fewer high-end American restaurants in Moscow than those serving Italian or Japanese cuisine, American-style has its advantages. “The American model is more democratic, not so sickeningly glossy and more understandable. Despite the fact that Russians tend to be negative about American food because of the overload of American fast food chains, Muscovites travel a lot and have a lot of interest in all things new,” Fadeyeva said. In addition to the food, which is sourced locally as much as possible, Saxon + Parole sets itself apart by offering a cocktail menu from Masahiro Urushido, Naren Young and Linden Pride in the atmosphere of an old-school New York bar. From the day the restaurant opened in late 2013, it has been impossible to get in. Tables were booked up weeks in advance in a city where most people call for day-of reservations. Fadeyeva believes that the key to Saxon + Parole’s success is the accuracy with which the American partners approached moving the concept from New York to Moscow, the efficiency of the Moscow team and the readiness of the audience for a project like Saxon + Parole. The audience, indeed, is ready. The only real obstacle for American restaurants hoping to move into the Moscow market is the high rental prices for real estate.